A cholesterol lowering diet is a good idea for a lot of people but especially for those at risk for heart disease or who have been told by a doctor that they need to lower their cholesterol. There are several drugs available that can help lower your numbers, but it's a great idea to try a cholesterol-lowering diet first to see if you can get your numbers down on your own. Recent scientific research suggests eating more of some foods, such as salmon, walnuts and oatmeal may help control your cholesterol. Additionally, it's important to limit foods high in fat and cholesterol to help lower your blood cholesterol levels. The most important fact you need to know when considering a cholesterol-lowering diet is that cholesterol comes from animals. If you eat meat, drink milk, eat cheese, or eat eggs, you are getting cholesterol from your food. Reducing your intake of animal products is one of the most important things you can do to reduce your overall cholesterol levels. Plant foods contain no cholesterol, so increasing your intake of plant foods is a good idea. Plant foods are also high in fiber, which traps and removes cholesterol before the body has a chance to digest it. In addition to these general recommendations, there are many specific foods that can help lower cholesterol. Including these foods in your daily intake is beneficial if your goal is to limit this damaging substance from entering your body. The types of fats you eat can also affect cholesterol levels, even if the foods themselves don't contain it, according to the Harvard School of Public Health. Monounsaturated fat, found in foods like olive oil, lowers LDL and raises HDL, for example. So do polyunsaturated fats such as corn oil and soybean oil. 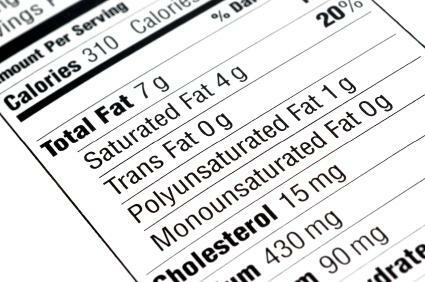 Saturated fat, which is found in whole milk dairy products, red meat, coconuts, and coconut products, raises both LDL and HDL, while trans fats, found in many fried foods, margarine, and anything with partially hydrogenated oils, raises LDL levels. One easy way to tell what kind of fat you're eating is that saturated fat is solid at room temperature. Polyunsaturated fat is liquid at room temperature. Because many fatty products are refrigerated, you might not see them at room temperature, so always read the label. Read nutrition labels when shopping, as well. Avoid foods that contain trans-fats and limit your intake of foods that contain saturated fats. Keep fatty, high-cholesterol foods such as sour cream and ice cream out of your house. Replace the butter and trans-fatty oils in your cupboard with olive oil and coconut oil. If you love eggs, try a cholesterol-free egg substitute instead of whole eggs. Use vegetables lightly sautéed in olive oil instead of a cream sauce on your next pasta dish. Substitute white wine vinegar or vegetable broth instead of butter to keep your pan moist while cooking. Both are fat- and cholesterol-free. Use herbs and spices to add flavor to dishes. Follow a diet plan that is proven to help lower cholesterol levels. If you need more guidance or a set menu plan to follow to help you lower your cholesterol, there are several diets that can help. Many diets have been created to lower your cholesterol levels, while also helping you to lose weight. Others, like the Mediterranean diet, help lower cholesterol almost as a side effect of the diet. Follow any of these diets as a starting point or as a way to make some other necessary diet changes in your lifestyle. A popular diet that should help to lower cholesterol is the Mediterranean diet. This diet emphasizes the use of olive oil, fish, fruits, and vegetables and limits red meat, which is perfect for someone looking for a cholesterol-lowering diet. The Mediterranean diet strives for balance in both eating habits and in life. It's more of a complete lifestyle change, rather than a diet you enter into for a short period of time. Some people use very low fat diet to help lower cholesterol. Diets like the Dean Ornish Diet are good for people with high cholesterol and have even been shown to reduce plaque and reverse damage to the heart. The Ornish diet is a vegetarian diet plan that allows no more than 10 percent of the days calories to come from fat. The rest of the calories come from protein (15 percent) and carbohydrates (75 percent). This is a great diet for those already following a vegetarian or vegan lifestyle who wish to lower their cholesterol or lose weight. The Pritikin Diet was created by a man suffering from heart disease. He created a diet plan low in fat and cholesterol that emphasizes healthy grains, vegetables, and legumes. The diet does not include any fats that are thought to be "healthy," nor does it allow for occasional indulgences. This diet may be beneficial to those that have an easier time sticking to an all-or-nothing plan, rather than one that occasional allows a slip-up. Choose whole grain products over refined carbohydrates. Limit saturated fat, trans fat, and cholesterol. Select non- or low-fat dairy products. Cut down on excess salt. Read labels to help you follow this advice. Not all cholesterol comes from food. Doctors and researchers think that the body can manufacture up to 75 percent of the cholesterol that ends up in the bloodstream, which is why a cholesterol-lowering diet is not always enough to reduce its presence. In order to safely and effectively lower your cholesterol levels, it is essential you work with a qualified health care practitioner. Your doctor will help you to decide whether you need cholesterol medicine to go along with your lifestyle changes. A registered dietitian will help you to plan a diet and lifestyle plan proven to be effective at lowering cholesterol. Remember that the most successful cholesterol lowering diet is the one that you will stick to. Follow these tips and guidelines to help design a cholesterol lowering diet that will work for you and your way of life.